Convert Your Van Ltd are a Company specialising in camper van/motorhome interiors and furniture kits, based in Sheffield, South Yorkshire. We pride our selves in offering quality kits at affordable prices. Here for sale is a'Convert Your Van Ltd' campervan/motorhome 5 berth interior furniture conversion kit supplied as a flat pack for an L4 ExLWB Relay/Ducato/Boxer or any other similar sized van. We can custom size the furniture to your own needs. How this works - at time of ordering we will send out a design with default measurements, you can then adjust these to suit your own needs, we will then cut the furniture to your desired sizes. Please bare in mind that flat packs for large vans are supplied square at the back, so will need cutting/shaping to the profile of your van. Before purchasing flat pack furniture please read our flat pack information form (which can be found on our website or at the bottom of this page). We also provide this as a fitted package see our listings. Please note: This price is for the furniture and cushions only and doesn't include any appliances/windows/lining etc, these would all be extra and can be supplied by ourselves at extra cost or you can supply your own and let us know the dimensions. Please see our website for further info. L-shaped seating area at front which forms a double bed. Rear Dinnette which also forms double bed. Raised rear single bed providing garage underneath. Cushions for above in a choice of fabrics. Toilet/Shower Cubicle (toilet/shower not included). 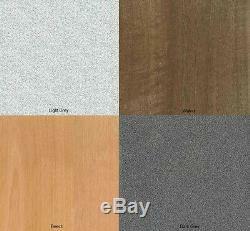 There is also a choice of finish for the furniture including light grey, dark grey, walnut and beech. Please note the photo is for illustration purposes only - this advert does not include appliances/windows/lining/etc, these can be supplied at extra cost - please see our website for optional extras. 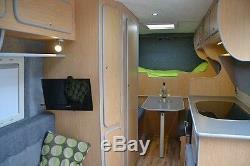 Included in this conversion is the furniture and cushions only. Large van / universal flat pack kits. Our universal large van flat pack kits are a great way to get a professional looking finish to your self build camper van at an affordable price, however you need to make sure that going down the flat pack route is the right option for you. Kits are made to order and are made to your own custom measurements and design. You can provide your own measurements or we can provide you with some initial generic measurements tailored to your van to get you started. Whilst we are happy to discuss designs and layout with you and offer as much advice as we can, it is your responsibility to make sure all measurements are correct and that the design is right. You need to take into account and think about location of wheel arches, windows, roof vents, etc. We will not be held responsible for any incorrect measurements or design. The kits come as individual pieces with all doors fitted and hinged and all edge trim fitted. All the panels come as square pieces so you will have to scribe them to match the shape and profile of your vehicle. It is your responsibility to make sure the kit is fitted safely and securely. We can repeat this process as many times as you want until you are 100% happy with design and are confident that all the measurements are correct. Once youre satisfied you sign off the drawing we are then ready to start cutting your furniture and making your cushions. These kits need to be fitted by someone who is competent to do so, a good level of DIY skills is recommended. You will need tools such as a jig saw and good quality electric screw driver. There are a lot of pieces Although the pieces will be labelled, there are a lot of them and the kits can be complicated so you need to make sure whoever is fitting the kit is confident in doing so and able to understand the 3D drawings. It is important to ensure that any appliances fitted to your vehicle are done by someone who is qualified/competent to do so and in line with regulations and guidelines. We would generally allow between 3-6 days to fit the kits depending on the design of the kit and the speed at which you work. Kits generally take between 2-4 weeks to make from the time of drawing sign off. The item "CAMPER VAN FURNITURE CONVERSION KIT 5 BERTH (UNIVERSAL)SUIT RELAY, BOXER, DUCATO" is in sale since Monday, August 28, 2017. This item is in the category "Vehicle Parts & Accessories\Motorhome Parts & Accessories\Campervan & Motorhome Parts". 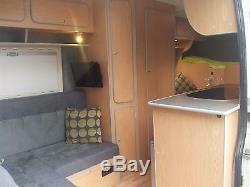 The seller is "convertyourvanltd" and is located in Dinnington, Sheffield. This item can be shipped to United Kingdom.